If politics makes strange bedfellows, capitalism arguably makes stranger ones. That may explain why these defiant words of farmworker organizer César Chávez are featured on a mural sited in one of the biggest corporate symbols of our time: a Bank of America branch in the Mission District. The piece, painted 40 years ago this June, is still in pristine condition, shielded from the sun that wreaks havoc on the Mission’s outdoor murals. 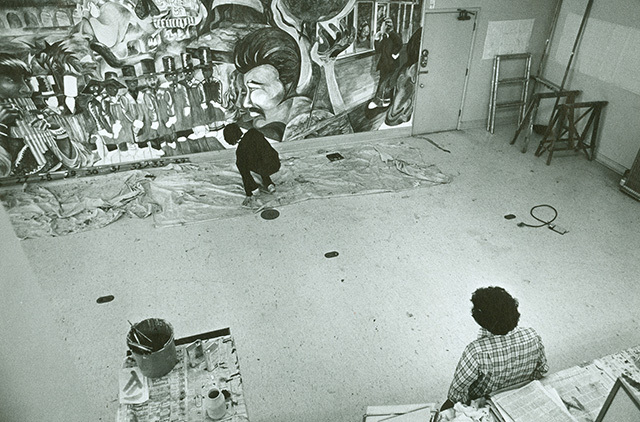 The branch at Mission and 23rd streets was undergoing renovation in 1974, and as part of its efforts to cater to the community, the bank hired three local artists to adorn its new walls: Jesús “Chuy” Campusano, Luis Cortázar and Michael Rios. Campusano, the chief designer, was a founding member of Galería de la Raza, the Latino artists’ focal point in the Mission. His black-and-white piece La Raza, in a style reminiscent of Picasso’s Guernica, can still be admired in Clarion Alley. Also involved in the project was Emmy Lou Packard, who commanded particular respect for her previous work assisting Diego Rivera and who took some of the iconic photos of Rivera and Frida Kahlo. As technical adviser to the bank piece, she was responsible for correcting the muralists’ method, making sure that they used the right brushstrokes and applied the right washes. Rios remembers her taking the artists to City College to observe and learn from the mural that she and Rivera had created there. For B of A, the result was an immense mural, 90 feet long, which blends references to murals by Rivera and others with local imagery. But while they honored their Mexican antecedents, they planted their work firmly in San Francisco and the Mission District. A section of the mural, for example, commemorates the extension of BART into the neighborhood. One local reference was excised before the mural was completed. In one scene, doctors are shown framed by a microscope and small circles suggestive of petri dishes or slides with disease organisms. One of these originally contained the seven-headed serpent symbol of the Symbionese Liberation Army, the domestic terrorist group that kidnapped and eventually converted media heiress Patty Hearst, Rios said in an interview. The bank, apparently hoping to avoid outright inflammatory imagery, asked the artists to change this detail. After some initial stubbornness, the muralists relented. In other respects, Bank of America took an almost completely hands-off approach, allowing the muralists to develop their own themes and ideas. The young artists threw themselves into the project with enthusiasm, Rios recalled. Bank of America provided an empty banking office in Hayes Valley as a makeshift studio, to give the painters space to work on a piece of such extravagant dimensions. The mural was split between the two 45-foot walls. Rios remembers the artists spending occasional nights at the office just to be able to cram more hours of work into the next day. The motifs took shape over the course of almost six months. Rios, a commercially trained artist with a rebellious streak who later created the cover art for Carlos Santana’s album Supernatural, had made his debut in mural art long before the term was even known in the Mission. In his early days, he was famous for painting over an advertising billboard so diligently that the agency ultimately surrendered it to him. The billboard occupied the outside wall of Galería de la Raza, where he first met Campusano. And the muralistas never forgot their own roots. And in fact, the mural became a neighborhood touchstone. David Mendoza, an archivist for Bank of America, says that non-customers from the Mission visited the branch to glimpse the wall. “The mural probably reflected how the community changed over time,” Mendoza said. “Thinking about how relevant it still is, I think it’s pretty cool” that it’s still there.